Whether you have to get on-board on an existing .NET project or you want to get an overview of your own project and use a more holistic approach to code improvement, you will quickly reach the limit of the tools provided by default in Visual Studio. Fortunately, Visual Studio (like most major development environment) does provide a good way to extend it and over time quite a few third-party tool vendors have started providing additional functionality for your favorite IDE. One such tool is NDepend. 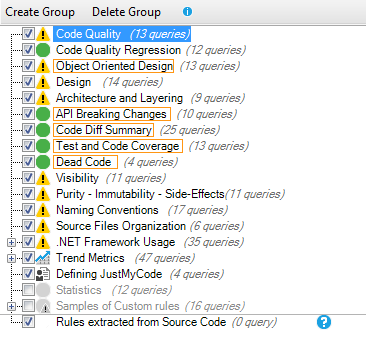 The goal of NDepend is to first provide you with means to browse and understand your code using better a better visualization than what’s available by default in Visual Studio. But NDepend allows you to go further than that. Let’s have a look at how you can improve your code and manage code improvement using this tool. Disclaimer: I was asked by the creator of NDepend whether I’d be interested in test driving it and sharing my experience on my blog. But the reason why I accepted writing this article is that NDepend has helped me improve the code quality in one of my project and I feel this is a tool with a lot of potential. I do not work for NDepend neither do I get any financial compensation from them (except for a free license for the tool). You can download a trial version of NDepend on their web site. The installation process is pretty straightforward. You download a ZIP file; extract it to some directory and start the installation executable. If you have a license for it, you just need to save the license file to the same directory where you’ve extracted the ZIP file. During the installation process, the installer will identify which Visual Studio versions (it supports VS 2008 till VS2013) are installed and allow you to install NDepend as an add-in. One thing I really like was that I was able to install it and activate it (over the menu Tools | Add-in manager) with needing to restart Visual Studio. Once you’ve activated NDepend, a new menu item will be available in your menu bar. A good place to start is the Dashboard. But also some metrics related to coding rules. 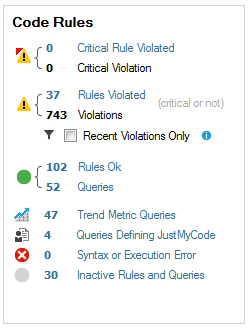 These code rules violations are clustered in critical and non-critical rules. All these metrics are available either as a view of the current status or as a graph showing you the evolution over time. Very often, especially when using NDepend on a project, which has already been around for some time, it is not possible to fix all violations at once and it’s important to be able to see whether we’re slowly reducing the number of violations or whether we have a negative dynamic and the number of violations are actually increasing. 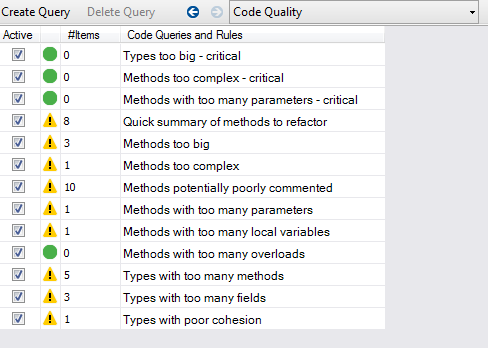 One of the most valuable features in NDepend is that all code rules are based on queries on a model. This means that you can adapt them, as you need i.e. in order to change a threshold or consider additional criteria. So you can adapt existing rules (the ones provided with NDepend) but also add your own rule groups and queries. Of course, that’s something you will only be able to use once you’ve invested enough time in learning how NDepends works. But modifying an existing rule is very easy. Queries can be activated and deactivated. And you can open the queries and rule editor by clicking on one of the queries. // We've commented # IL Instructions, because with LINQ syntax, a few lines of code can compile to hundreds of IL instructions. All queries I’ve looked into seemed to be very well commented. This made it easy to understand what the rule is about and how to modify it to comply with one’s coding rules. So in our example, in order to change the threshold for the “Methods too big” query, all you need to do is replace 30 by e.g. 40 and save. Additionally, you can press the “Critical” button to mark this rule as a deal breaker i.e. when called during a build, it will return an error code so that you can refuse to build the software if some critical violations are detected (of course I doubt you’ll use it with a “Method too big” violation). Except for the ability to customize and extend the NDepend rule set, another thing I found very useful is the ability to create and work with trend charts. The ability to create baselines for comparison is also a nice feature related to this topic. Whenever you start working with static code analysis on a project which has already been around for quite some time, you end up getting a huge list of findings. It’s rarely the case that you can fix them all in the short term. What’s really important is to fix the critical violations and make sure that you first do not introduce more violations as your code evolves and also with every new version try and reduce the number of violations (starting with the most important ones). 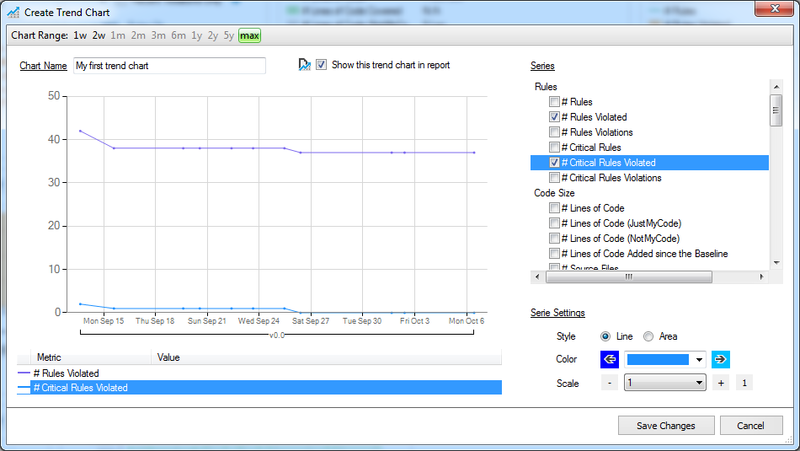 You can give your new trend chart a name choose which series will be defined and how they should look like. 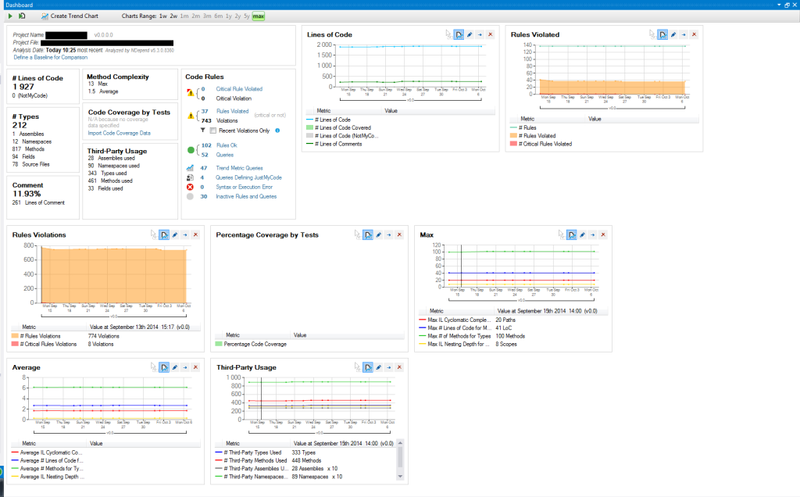 Once you save your new trend chart will be displayed in the dashboard. This entry was posted in CSharp, NDepend, Visual Studio. Bookmark the permalink.